A beatiful relaxant theme with a dynamic rotation sky. 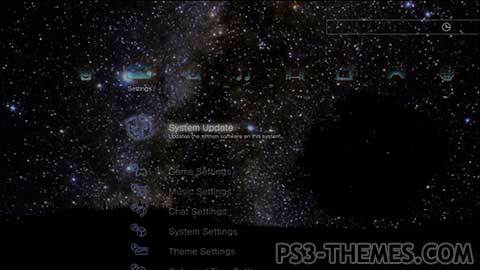 This theme was posted by PS3 Themes on June 26, 2015 at 12:58 pm, and is filed under Animals/Nature, Dynamic Themes.You can leave a response or trackback from your own site. Very awesome dynamic space theme!!!!!!! Thanx!!! Hey can someone instruct me on how to pm? Can someone send me a pm on how to send a message? I am a noob because I haven’t been here in forever! theres only one problem with the ghosts and zelda theme, whenever i look at them it makes me remember all those times i drank too much booze and the whole room would spin, lol. probably because my tv is to the left and thats the way the room would spin when i lay on my bed. your playing with my mind faxtron. Great job Faxtron the only problem home I noticed that the stars are blending through the grass as they are going through it’s formation. I liked it though. if you look close, you can see stars in the dash icons, epic…..